The fallout from a deadly Brazilian dam collapse is far from over for two of the world's biggest miners. 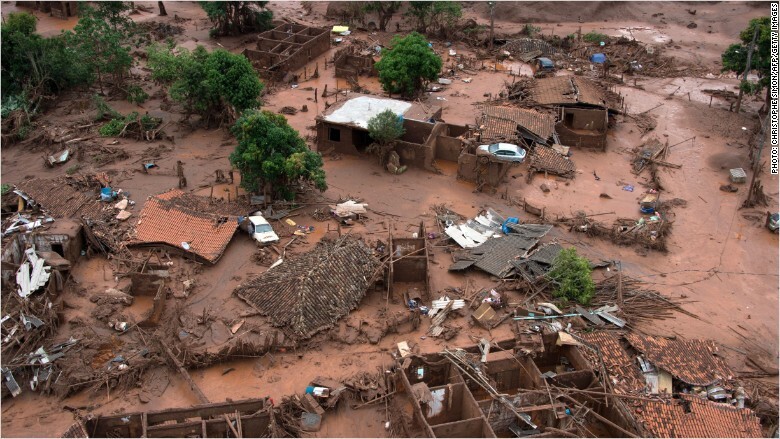 Federal prosecutors have filed a civil lawsuit against Brazil's Vale (VALE) and Anglo-Australian miner BHP Billiton, seeking 155 billion reais ($44 billion) in damages over the dam collapse in November that killed 19 people. The disaster unleashed a wave of toxic mud and sludge that buried a village and washed downriver to the ocean in what officials have called the worst environmental disaster in the country's history. BHP (BBL) shares trading in Sydney plummeted nearly 10% on Wednesday. In a statement, the company said it had not yet been formally notified of the suit. Investors had hoped that a $6 billion settlement announced by President Dilma Rousseff in March would shield the miners from further claims. But federal prosecutors operate independently of the government in Brazil. The prosecutors, who have been conducting their own investigation into the dam collapse, said that the previous settlement was inadequate and failed to include input from victims. The deal "does not completely, adequately and sufficiently cover the collective rights of the victims, and violates their constitutional rights," the prosecutors said. Related: Mining stocks soar ... but can it last? Prosecutors said they arrived at $44 billion in damages by comparing the dam collapse to the Deepwater Horizon disaster that killed 11 people and caused a massive oil spill in the Gulf of Mexico. That disaster cost BP (BP) more than $55 billion. Brazil's federal prosecutors have previously filed multi-billion dollar suits in the wake of environmental disasters, only to later settle for smaller payments. BHP said in a statement that it believes the original $6 billion agreement "provides the long-term remedial and compensation framework for responding to the impact of the ... tragedy and the appropriate platform for the parties to work together." Vale made similar comments in support of the existing agreement and said it "will take all necessary steps to defend itself." -- Elwyn Lopez and Nina dos Santos contributed reporting.